I'm a little surprised that all the years I lived in Pittsburgh I never heard about Jackie O's Pub and Brewery in Athens, OH. Thanks to the work of the ever-vigilant beersage, I now know about them, and I'm pretty impressed by the art, which tends to display strong line drawing skill. Let's look at a bunch of art from their bourbon barrel-aged beer. 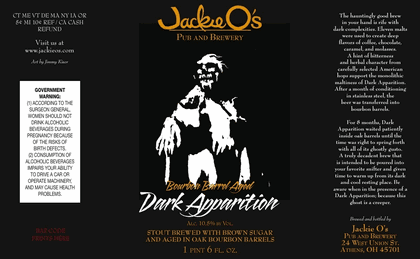 The Dark Apparition label is nice white-on-black with a little bit of a yellow-orange thrown in for traditional Halloween coloring. The one problem I have with at least this image of the label is the black-on-dark-gray thing, which just looks weird. 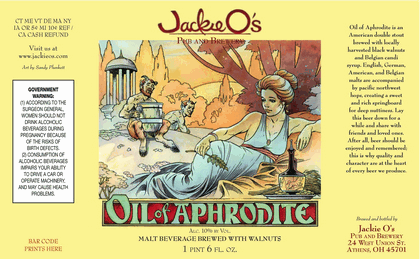 The Oil of Aphrodite is similarly line-driven, but obviously much more intricate and colorful. The perspective with the satyrs and the little temple isn't perfect, but the foreground Aphrodite image is well-drawn. The use of differing shades of orange is a nice way to indicate layers at different distances. The Matriarch is a double IPA. 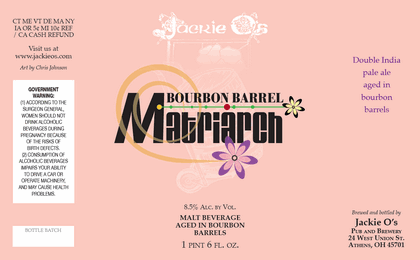 We've had discussions before about femininity in craft beer design (or the lack thereof), so the use of pink and flowers and swirls is a pleasant surprise, particularly for a DIPA aged in bourbon barrels. I don't recognize the font, but I actually like it, even though it's vaguely Impact-like. Simple pen-and-ink line and shading. 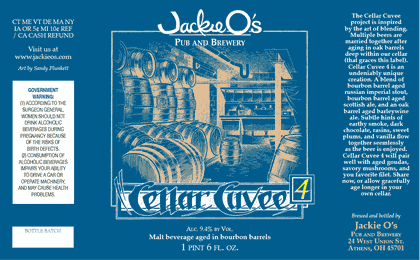 It's a nice old-timey look at a cellar, and they use the barrels fairly well to demonstrate perspective, with the possible exception of the little one in the center that looks a touch out of place. 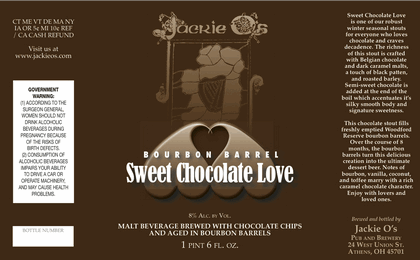 Lastly, the Sweet Chocolate Love label uses a couple of brown upside-down hearts (which suggest Hershey kisses but don't look enough like them to be an infringement of intellectual property). The backdrop is a map of Ireland with the traditional harp, I think maybe because it started as an Irish stout before being banished to sit with Belgian chocolate in a bourbon barrel for a while. They do a good job here, as with their other labels, of getting depth out of shades of one color. Jeff Alworth did his DMS anti-awards, and included a worst label art category. His winner was the really angular, uber-masculine "sports drink" style of stuff from Pyramid. The Dieline had a nice post on Estrella Levante's aluminum bottle design.